Slots have been added through the end of May, including Holy Week and Easter. Thank you for your patience. Assisting Ministers please leave lector slots open. If no lector signs up, we will let you know to also do the readings. Confirmation Students serve as acolyte and crucifer (or youth communion helper at contemporary services) as part of the Confirmation Program. Each student should plan on serving 10 times during the year. (September 2018 - September 2019). 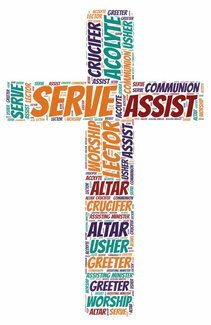 Older youth and adults are invited to serve as Acolyte and Crucifer too. Lastly, so that everyone has a chance to get the service they prefer, please vary your early and late service times.